santa, originally uploaded by Venus In Furs. We went to see Santa at Macy's Santaland in Herald Square today. Gibson napped on the train, was patient throughout the 45 minute line, and thoroughly enjoyed the winter wonderland of animatronic things and toy trains. 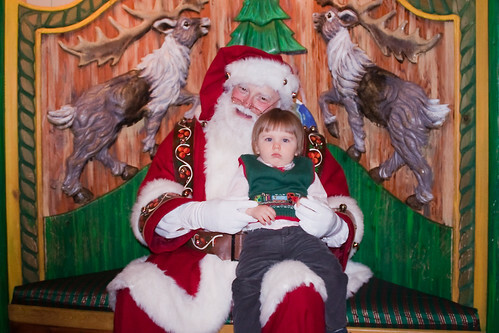 He was however, less impressed with Santa. To tell the truth he was actually pretty close to a cry by the time he got on the big man's lap but settled on a pout.